Review - Earlier this month RISCOS Ltd announced it was making ROM images of RISC OS 4.02 available for download from its website for a fiver a copy. Here we briefly review what you get with the ROM image package, dubbed 'virtually free' by RISCOS Ltd, and what you can do with it. Traditionally the core components of RISC OS - its kernel, device drivers, filing system support, networking support, multitasking desktop environment, a collection of useful applications and other bits and pieces - have been supplied on read-only silicon chips, namely ROM chips. These chips are plugged into the computer's motherboard and are accessed first by the processor when the machine is switched on. Generally speaking, the data stored on the chips can't be erased and altered, thus protecting the core of the OS from malicious software and users, and ensuring a basic system can still be booted even if something catastrophic like a hard disc failure occurs. Certainly in times past it also allowed the OS to boot rapidly into the desktop as information can be retrieved from ROM chips faster than data from a hard disc - although, obviously, ROM chips have nowhere near the level of capacity of hard discs. RISC OS 2 started out as a 512KB ROM chip set, working its way up to 4MB by RISC OS 4.02. By version 4.39, the core OS was now 6MB in size but was compressed to fit inside a 4MB chip set. Even for 4.02, a sizable chunk of the OS's software has to sit on a hard disc or some other storage device as ROM chips cannot hold the full OS. A ROM image is a copy of the data stored on the ROM chip set as a file on disc. 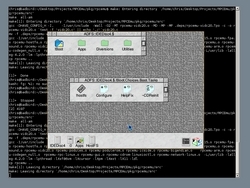 Software that emulates RISC OS hardware can load these ROM image files into memory and execute them, allowing the OS to run. RISCOS Ltd also ship ROM images as part of its Select updates subscription scheme, allowing users to boot into new OS releases on native hardware without having to change their ROM chip sets. What's in the ROL ROM image package? Once you've paid for your 4.02 ROM image from the ROL sales website, which seems to be powered by a third-party e-commerce provider, you are emailed a link from where you can download a zip file. This archive contains a copy of the RISC OS 4.02 ROM image, a set of instructions in plain text, HTML and PDF formats and a RISC OS executable called ROS4disc, which is used to complete the installation of RISC OS 4.02 in the emulator. There is no RISC OS 4 user guide, however. The instructions are well written and comprehensive, and explain how to download and install RiscPC-class emulators Red Squirrel and RPCEmu for Windows and get them to use the RISC OS 4.02 ROM image. Red Squirrel is the freeware predecessor of the commercially-available VirtualRiscPC (which comes with its own ROM images and works on Windows and Mac OS X), while RPCEmu is an open source RiscPC emulator. The instructions do not specifically explain how to install and use the Linux and Mac OS X RPCEmu ports with the ROM image - although it would be unfair to criticise ROL for this oversight as these two ports are not, as yet, packaged up in an entirely user-friendly form. However all is not lost: reasonably competent users of these platforms should be able to cope. Linux users can try this useful RPCEmu Linux installation guide, and skip the section about extracting data from ROM chips and instead do the following: unzip the ROL-supplied zip file and copy the RISC OS 4.02 ROM image file (ROM402) into RPCEmu's roms directory and rename the ROM image file rom. Similarly for Jon Welch's Mac OS X port of RPCEmu, download and unzip the port's zip and do the same with the ROL-supplied zip file, and then copy the 4.02 ROM image (ROM402) into RPCEmu's roms directory as a file called rom. For both ports, continue to follow ROL's instructions in terms of copying the RO4disc executable into RPCEmu's hostfs directory, and running it from inside RPCEmu. For RPCEmu newbies: the roms directory is used to store the ROM image files and any files placed in the hostfs directory can be accessed from RISC OS running on the emulated computer - which is useful for passing documents and other files to and from the computer running the emulator and the emulated machine. Incidentally, hard discs in RPCEmu are treated similar to ROM images: each hard disc is stored as a single file on the host computer and it contains the data that would otherwise sit on a real disc's magnetic surface. RPCEmu can read and write to these hard disc image files as RISC OS accesses what it thinks is the hard disc system's electronics, thus simulating a real disc. The RO4disc executable contains the new RISC OS 4 !Boot application and several other support programs, which automatically unpacks and installs itself when run from inside RISC OS. Once RPCEmu has been downloaded and installed, and the RISC OS 4.02 ROM image has been bought, downloaded, unzipped and the ROM402 ROM image and RO4disc executable copied into their proper directories, we're ready to rock and roll. Here's a series of screenshots showing RPCEmu running the new 4.02 ROM. Click on a thumbnail for a larger image. This ROM image was used in an experimental RPCEmu build running on Debian GNU/Linux in an ultra-minimal evilvm X Windows desktop - so excuse any graphics glitches in the screenshots. Welcome to the RISC OS 4 desktop and shown is the HostFS directory containing the RO4disc executable we're about to run. This particular RPCEmu installation already had a so-called Universal RISC OS !Boot installed on its hard disc, as per the aforementioned RPCEmu Linux port installation guide. As mentioned in ROL's documentation, don't forget to open the Task Manager and whack the Next slot up to at least 8000K to set aside enough memory for the RO4disc executable to load and run. After running the RO4disc program, a little window like this appears. Drag the icon to the hard disc iconbar icon. Once it's complete, the hard disc root is populated with these new files and directories. As per ROL's instructions, move the !HostFS application into this particular directory within the !Boot. Ok, nearly done. Time to reboot the emulated machine. Just after the RISC OS start-up text banner appears, the OS starts booting its files from the hard disc. Woo-hoo, welcome to RISC OS 4.02, circa 1999 when it was first released. 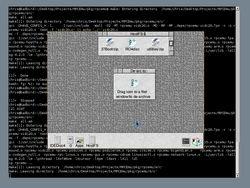 The RISC OS 4.02 desktop and ROL's jigsaw-puzzle themed system configuration program running. The software unpacked to the hard disc includes ArcFS and SparkPlug, which can be used to unpack archives and zip files within RISC OS and the standard RISC OS applications: CloseUp, SciCalc, Squash, Blocks, Clock, Flasher, MemNow, Meteors, Patience, Puzzle, ChangeFSI, HForm, ResetBoot, SaveCMOS, ShowScrap, T1ToFont, Patch, Alarm, Chars, Draw, Edit, Help and Paint. Bear in mind that RISC OS 4.02 is considered the absolute baseline operating system version by developers - it is often referred to as 'vanilla RISC OS' because it is, compared to later releases, fairly basic - the features list is here. It was born from the RISC OS 3.8 source code rescued from Acorn after the company was broken up in 1998 and was an early RISCOS Ltd OS release. In fact, looking at the version numbers of the shipped software and modules, it's almost a perfect snapshot of the OS from that era. Therefore users may be interested in checking out these freely-available OS 4 updates from the ROL support website for new and improved components released since 1999. For the purposes of running old software and games again, RISC OS 4.02 is perfectly usable and stable. For any competent user, installing this ROM image should be a breeze. It is rather bare-bones in nature but for a mere five pounds sterling, you get what it says on the tin: RISC OS 4.02 for your emulator. Bish, bash, bosh. • RISCOS Ltd boss Paul Middleton told drobe.co.uk: "The new website is doing brisk business with orders from around the world for the RISC OS 4.02 ROM image." I got a copy from ROL and installed it using the guideline in Red Squirrel and in RPCEmu. Setting up both was no problem at all thanks to the guideline provided and both work as expected. Thanks for this. Very straightforward. The riscos.info page referred to in the article now contains setup instructions for the ROL ROM image. At tonight's ROUGOL meeting I'm going to have another go at getting RPCemu running on a standard EeePC, which we failed to do last month (the EeePC used for the demo had Ubuntu on it). As I've never used an EeePC or Xandros, and am not to familiar with the packaging systems, this could be amusing! why not aimply use the default xandros? It ia stripped down to use less resources and run faster. Like Ubuntu it is also Deb based. If that fails, you'll probably have to add some repositories. Try this: [link] That suggests that using vanilla Debian repositories isn't a good idea, but there are others listed. When I got my eee in nov2007 I immediately dowloaded kmsserver and kicker to gove me kde so I'm talking from that perspective. I normally dont go to the xandros depositorties (although I do have a licensed copy of X4.1. I simply go to the sourceforce page etc adn download the .deb file. Then right click on this to install using the standard installation method. I also only use my eee for the train or travelling so I dont do any fancy stuff with it. Don't keep us in suspense! I'm getting a Linux Asus eee PC for Christmas and would like to run RPCemu on it. Did you manage to get it to work? Theo: you found the same links as me! I had bookmarked them to use during the meeting. Note the start up banner in image 7. You want to remove the ROMPatch stuff from PreDesk since this code fails (seems to not be needed). One result if this failure is that the other files in PreDesk are not run, that is the network setup is not done e.g.